At Loeb Boathouse, visitors can rent rowboats, hire an authentic Venetian gondola, or dine overlooking views of the Lake. Boating on the Lake has been a popular pastime from the Park's earliest days. Six rustic landings originally dotted the water's edge, and a number of kiosks functioned as ticket booths where visitors could hire rowboats, gondolas and even multi-seat call boats. As interest in rowing grew, the Lake needed a proper boathouse. In 1874, Park architect Calvert Vaux designed a rustic building on the eastern shoreline on the spot where the boats are stored today, to provide covered space for docking and storage. With its charming Victorian touches, the building also featured a second-story terrace that afforded beautiful views of the Ramble. A popular draw for more than 80 years, the boathouse fell into disrepair by 1950 and was soon torn down. 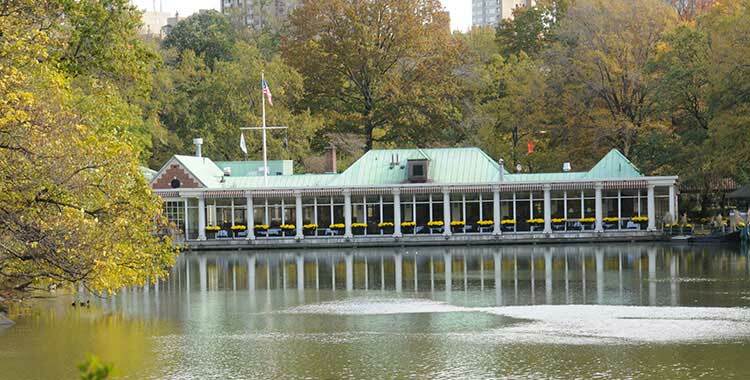 The Loeb Boathouse that New Yorkers and visitors know so well today opened at the Lake's northeastern tip in 1954. There is a formal dining room and a popular cafeteria that even has a welcoming fireplace in winter. The Boathouse also serves as the unofficial headquarters for birdwatchers who record their sightings in a loose-leaf notebook that is kept inside the Boathouse. The hand-written sitings of bird life has become a cherished Park tradition. Park visitors can enjoy fare from the Boathouse Express Cafe with wonderful views of the Park. Or enjoy a more formal meal at the Lakeside Restaurant, which offers breakfast, lunch, brunch and dinner, as well as a full bar.